A strikingly splendid example of a two-color quilt, Sarah's beauty has been showcased in various capacities since its acquisition by Old Sturbridge Village. 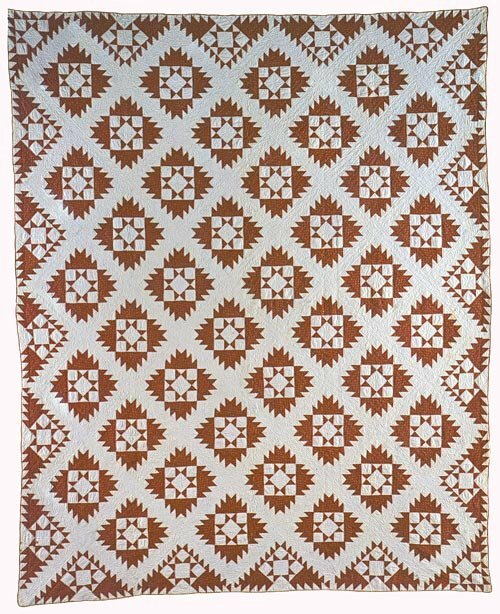 It is a pristine example of the turkey-red and white quilts prevalent during the mid-nineteenth century. Sarah's version of a Sawtooth Star, combined with a delicate quilted vine in the sashing, produces an impressive and eye-catching design. Make a smaller version with fewer blocks for a wallhanging of stunning proportions! Rotary instructions, along with the more traditional hand piecing directions are included for this 82" x 99 1/2" antique quilt, as are the quilting stencils which have been traced directly from the original quilt.